Contact Arby’s: Find below customer service details of Arby’s, including phone and email. Besides contact details, the page also offers a brief overview of the restaurant chain. Arby’s is an American fast food chain founded by Forrest Raffel and Leroy Raffel in 1964. Headquartered at Georgia, Arby’s presently operates in more than 3,400 locations. Besides the United States, it has active presence in Canada, Turkey, UAE, Qatar, Kuwait and Egypt. Arby’s operates as a subsidiary of Inspire Brands. Many of the Arby’s stores are operated through the franchise model. Arby’s claims it is the second largest sandwich restaurant brand in the world. Locate an Arby’s restaurant nearest to your address by city, state or zip on the website. You can access the menu online and know what you can buy at the stores. Also get the nutrition and ingredients online. As for food you can find at Arby’s, there are beef/pork/chicken/turkey sandwiches, salads, sliders, sides and desserts. Top items on the menu include Roast Beef Gyro, Turkey Gyro, Traditional Greek Gyro, Smokehouse Brisket, Reuben, Loaded Italian, Beef N Cheddar, Grand Turkey Club, Chicken Tenders, Chopped Side Salad, Crispy Chicken Farmhouse Salad, Curly Fries, Potato Cakes and Onion Rings. Interested in a business opportunity? 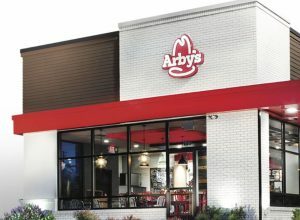 As one of the fastest growing sandwich restaurant chain, Arby’s invites individuals and business owners to partner and enter the restaurant business. Arby’s helps with marketing, franchising, and provides operational support as you get started. The investment, licensing fee and others you can get by reaching the company’s executive. You can also provide your details online to get franchise information. After receiving your application, the company will do a financial inquiry, background check, and credit clearance. Arby’s is expanding in select global markets like Hong Kong, Singapore, Philippines,UK, France and Mexico. For more information or queries on restaurant locations, menu, career, or others, reach the Arby’s support.